Intelligent magnetic construction set for brain development! Explore and experiment with these two basic geometric shapes, the square and triangle to create more complex 3-D models. The length of each edge of the different geometric shapes is the same so when the shapes are connected, the powerful magnet at the centre of each edge pulls the shapes together to match perfectly. 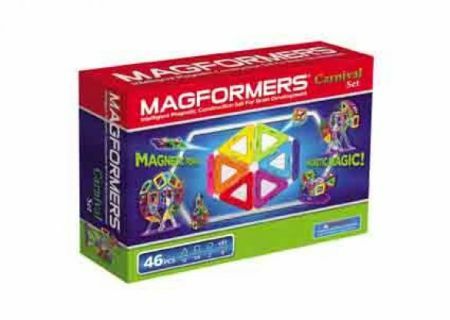 Feel the magnetic force and have hours of fun exploring the Magformers connection possibilities! Contents: 12 triangles, 24 squares, and 2 hexagons, each edge is 2.5", includes 8 carnival accessories.